The Argent Tournament Grounds are located in the northern part of Icecrown, and they hold a gold mind of daily quests that any World of Warcraft player is sure to enjoy. There are several reasons WoW players might choose to complete the daily quests at the Argent Tournament Grounds. Of course these are the usual reasons like gold and reputation, but the Argent Tournament dailies work a bit differently than other WoW dailies. To become eligible for the daily quests at the Argent Tournament grounds, you must first complete prerequisite quests. You’ll start with “The Argent Tournament,” and then move on to “Mastery of Melee,” “Mastery of the Charge,” and Mastery of the Shield-breaker.” After this quest chain is complete, then you move on to “Up to the Challenge” and are eligible for the daily quests at the Argent Tournament Grounds. The major difference between the Argent Tournament daily quests and the WoW dailies in other parts of the game is that it’s not always cut and dry which faction you’re earning reputation for. You can eventually earn reputation with all five of your faction’s capital cities, but you will start out earning reputation for your home capital city. For example, dwarves will be earning reputation with Ironforge and Tauren will be gaining reputation with Thunder Bluff, and so on. You can later earn the right to also represent some of the other capital cities in your faction. Some of these quests will also give you reputation with either the Silver Covenant (Alliance) or the Sunreavers (Horde). The Argent Tournament Grounds also has its own hierarchy as far as reputation goes. You have to earn titles for your character before you can be eligible for the higher daily quests. For example, you have to begin by earning the title of Champion. Next, you’ll work on the title of Crusader, and each of these levels within the Argent Tournament Ground has its own rewards, which include heirloom gear that’s bind-on-account and some level 200 gear. All rewards in the Argent Tournament Grounds are purchased with Champion’s Seals, which are earned by running the Argent Tournament daily quests. The most important thing to remember about the Argent Tournament Grounds is that they can be a lot of fun. Many of the daily quests in the Argent Tournament Grounds involve jousting and battling opponents in an arena, and these daily quests are quite a bit different than other WoW dailies. 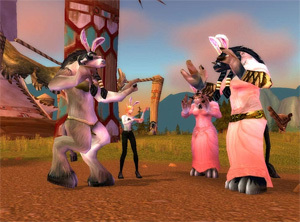 Of course there are the quests that involve going to an area and killing a specific type of creature, but many WoW players simply enjoy the unique nature of the daily quests that are available at the Argent Tournament Grounds.